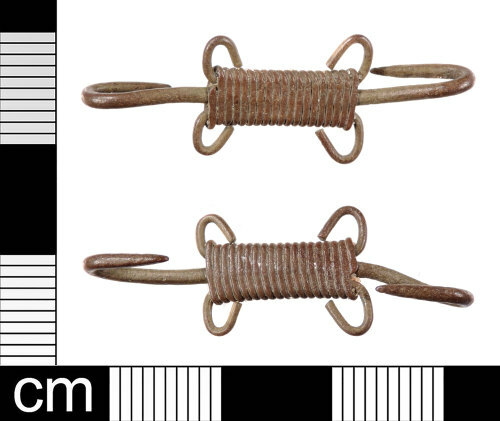 A Post Medieval copper alloy wound wire hooked fastener dating to the 16th century. This hooked tag is constructed from lengths of wire. one length of thicker grade wire has been shaped to from the hook at each end. A thinner grade wire has been wrapped around the body of the hooks to hold their shape. This thinner wire has been hammered flat once in place. This thinner wire has also been used to form a loop at each end. Similar wound wire hooks and other accessories are illustrated and discussed in Egan & Forsyth (1997:227). Dimensions: length: 35.19mm; width: 11.90mm; thickness: 5.41mm; weight: 1.47g. Reference: Egan, G. and Forsyth, H. 1997. Wound Wire and Silver Gilt. In Gaimster, D. & Stamper, P. 1997. The Age of Transition. The Archaeology of English Culture 1400-1600. Society Medieval Archaeology Monograph 15 (Oxbow Monograph Series 98) Oxbow, Oxford.